Photography and Text By Ken Beedle © All rights reserved. I got to Rincon de Viejo just as the last moments of light were disappearing. The 20km drive from the Pan American Highway was interesting. 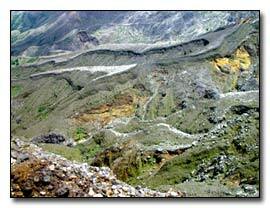 The soil and rock structure created by ancient lava flows made the drive like no other I had experienced in Costa Rica. The undulating road had been carved through the soil stratums showing the multi-colored mixture caused by volcanic deposits and sand. Even as dry as this area is it wetted my appetite for what was to come. Little did I know the trek was going to be 10 miles carrying 30 lbs! The next morning I ate at 6:45 and began the 5,800-foot climb at 7:30. It was easy at first but after 2km sweat had soaked my shirt. Birds were everywhere! I saw a magnificent Toucan, heard Quetzals but could not see them. The cacophony of sounds from the surrounding forest was the greatest I had experienced to date in Costa Rica. Only an occasional howler monkey interrupted the music of the forest. At 4km the angle of ascent became steep. I was still breathing easy but taking short breaks every 20 minutes. Unlike Volcan Baru in Panama, the altitude was not going to become a problem but I was carry a backpack, a large fanny pack and tripod. When the path narrowed so only one foot could be placed in front of the other I became concerned about rattlesnakes. They are common in this area. Most of the time I could not see my feet and it was slippery causing me to occasionally fall. I encountered only two other pairs of hikers to this point and they had passed me long ago. I was resting more because the assent was the equivalent of climbing flights of stairs 1.5 miles high! I could see Rincon de Viajo on my left but Santa Maria on the right was in the clouds. The sign read Crater Activo 2.2k to the left and another Crater Activo 1.7k to the right. I remembered getting so close to Volcan Baru but failing in the final 100-meter climb to the top and it strengthened my resolve. Taking the longer trail to the left I was going no matter what it took out of me. No sooner had I began climbing again than the wind began rising. My friend Cisco had warned me about the wind. It was only blowing in gusts of 20 mph but as it freshened I began to wonder what the top would bring. 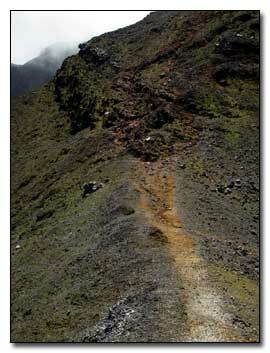 The path flattened a little and was not as steep but looking up it was obvious it was going to become worse. The thinner air was making me short of breath. The trail was becoming narrow again. I needed to rest. I was along a 500-foot cliff bordering the lava flow. About two hundred meters ahead the trail funneled to five-foot. The increasing gusts of wind were forcing me to struggle to maintain my balance. To my left, the long dead multi-colored lava flow from Rincon de Viajo was an awesome sight. It was sculpted with deep copper and steel gray pockets with cream color 20-foot high streaks sometimes mixed with a deep red. 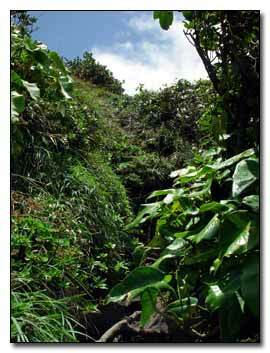 Scattered through the lava was pockets of green vegetation. 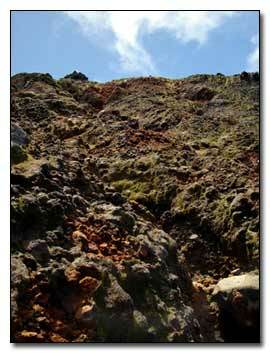 The barren crest of the volcano was perhaps 150 meters higher and straight up. To my right, the rim of cloud-covered Santa Maria could be seen but little more. Behind I could see the outline of the Pacific coast through the salt air but little more. Looking at what still remained of the climb I was confident I could make it but the carrying the backpack up 50 meters that appeared to be straight up was going to be difficult. I had been climbing for almost 4 hours and the most difficult part remained. As the trail became a narrowed to no more than the width of my shoe the wind increased to 80km (48mph) with higher gusts. One slip and there was nothing to stop me from falling 100 meters or more because I could not see where it ended. It was time to leave the backpack. I had carried it four miles up the mountain but it was making me feel like a tightrope walker crossing Niagara Falls in the stronger gusts. With less than a mile remaining I wedged the bag with the lenses and 35mm Nikon in the rocks keeping the lighter digital camera around my waist. I was out of water and the rest of the climb was a 75 degree angle straight up but I was going to make it. At 60 years old, I was not quitting. I crossed a 100-foot catwalk trail and murmured a prayer of thanksgiving the backpack was behind me. The final assent was difficult because the rocks were sharp and loose. The trail through the rocks was little more than a foot wide and it was like climbing a 200-foot ladder. Occasionally the loose rock and gravel would breakaway causing me to slip. My skinny legs looked like they had been shaved with a dull razor. About halfway I turned around, leaned back into the mountain and fell asleep for 30 minutes standing straight up wedged between the rocks. I woke refreshed. When the trail finally opened I could see the top of the twin volcanoes above me. I found some rainwater in a pool and drank it. I saw two young guys whom I had given a ride to in the morning coming toward me. They had been to Santa Maria and waited for an hour for the clouds to clear from the crater and finally gave up. They strongly advised me not to go to Santa Maria because the wind was an 80 km gale. I must have looked bad because they insisted I take a bottle of water and two energy bars. I knew what Moses and the Israelis must have felt like in the desert because this was like manna from heaven. It was now 1pm and weather was moving in. I was tired and decided reaching the top and a safe return was more important than trying to walk over the mountain to Rincon de Viejo perhaps a half mile away. I took a few more photos and began the decent. Going down is always more difficult than going up. When I reached my backpack I could hear Silvia’s voice in my head saying, "Ken, you need to take care." She was always worried about my safety and would sometimes admonish me because of the risks. I am sure she was going to be appalled with condition of my legs. What little meat remained on them had been carved away by the lava rock. Fog was moving in and I had over three hours remaining down the mountain. On the way, I met a couple from Pompano Beach, Florida on their way up. I thought they were crazy climbing this late in the day. Their return through the forest below would be in darkness. We talked for a few minutes and agreed to meet for dinner at the lodge. When I reached the forest it was thundering above and a light rain was falling. I worried about the people from Florida. Unless they had turned around they were going to be in trouble and perhaps, stuck on the mountain. Even downhill I was forcing myself to rest every 30- minutes. The rain was increasing and it was getting darker. I had my poncho covering all my gear. Silvia was right, I needed to take care because the trail was like a greasy marble floor. Birds were still chattering but with not as much enthusiasm. Howler monkeys were loudly claiming to their preferred tree in different parts of the forest. I fell heavily but was cushioned by the backpack. I worried about the people from Florida. They were in trouble. I passed the sign that said 4km to go then 2km. It was 5pm. At 5:30pm I emerged from the forest elated but thankful the Jeep was in sight. The people from Florida never came to dinner. I do not know what happened to them. I did not see them at breakfast the next morning. My guess is they spent the night without camping gear, wet and cold and surely covered with insect bites somewhere in the forest. The morning was beautiful at the lodge but the weather on the mountain and forest immediately above was covered in mist. I decided to leave for Parque National Santa Rosa rather than trying to return to the forest for more photos. I am going to return soon. There is much more to see. This was the most fascinating place I have found in Costa Rica. It is mystical, a large measure of risk making for a great adventure.